Jane Chu knows a secret. The National Endowment for the Arts (NEA) Chairman was officially welcomed into the Raul Quintanilla Sr. Middle School DaVerse Poetry Club with the secret handshake. Students christened Chu as an honorary member during her Quintanilla visit Monday afternoon, November 28, 2016. Big Thought hosted the Quintanilla jaunt, which began with a roundtable conversation featuring Big Thought staff and partner representatives. Chairman Chu conversed with Guy Bruggeman, Dallas Love Field; Janiece Evans-Page, Fossil; Will Dowell, Behind Every Door; Will Richey, Journeyman Ink; Lela Bell, Teaching Artist; Antoine Joyce, All Stars Project Dallas; David Fisher, Office of Cultural Affairs; Kjerstine Nielsen, Dallas Public Library; plus Big Thought’s Gigi Antoni, Erin Offord, LeAnn Binford, Leila Wright, and Shianne Patrick. Chairman Chu made the trek from the nation’s capitol to visit with various local community leaders and speak at the Dallas Arts District Community Breakfast on November 29, 2016. The NEA has funded several different partnership initiatives coordinated by Big Thought over the years, including most recently its support of Dallas City of Learning. Big Thought also managed the Dallas portion of the NEA’s inaugural Musical Theater Songwriting Challenge for High School Students, which culminated last July in New York City. Back at Quintanilla Middle School, Gary Gibbs, Executive Director of the Texas Commission on the Arts; Chad Pendarves from Congresswoman Eddie Bernice Johnson’s office; and the NEA’s Meredith Raimondi also participated in the roundtable discussion. It began with Chairman Chu providing an update on NEA initiatives, and continued with partners sharing about their programs, their personal inspiration, and how the arts positively impact children. Chairman Chu arrived in Dallas with a passion for hearing diverse perspectives from the community, and seeing quality programs in action. 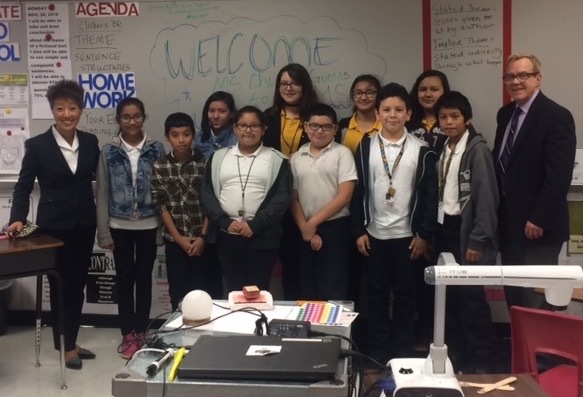 So she was duly delighted when the Quintanilla DaVerse Poetry Club students launched into a call-and-response warm-up led by DaVerse Lounge creator Richey, and then followed through with an activity that had students and adults creating personal poems that were shared one-on-one. She bonded with those kids. Not only did they shower Chairman Chu with performances of original poems, but they also taught her that secret handshake. She’s official now. Big Thought extends sincere gratitude to Quintanilla Principal Salem Hussain and DaVerse Poetry Coach Lisa Taylor for their hospitality.